Our CS:GO Faceit boost is provided by professional players, working under contract – Over 15000 Orders done provided by 3000+ elo and FPL Players . Thats 7 orders per day by over 1000 unique clients. Imbaboost is the oldest CS:GO boosting company. We offer Faceit Level boosting and Faceit Elo boosting for skins . Trust in our 6 years of experience. Order TEST GAME now and play with us. Faceit Boosting - How it works? Pick one of the Boosting types. Just Click on one of the buttons below, next to orange one. Fill in the order form, choose your preferred contact form and then make payment. Our support contact you using your prefered contact form. You can also skype us. Usually we make 6-12 wins per day. We work 8-12h a day like every registered company. When your order is done we notify you with email. You can also get text sms or message on skype. Faceit Level Boosting – How it works? Faceit Level Boosting is an option where you can buy Faceit Boosting per level. In this option, you pay for level as a results, so if you buy a particular level, we will be working on it until we get your desired level no matter what. This option is available in SoloQ and DuoQ mode. During Faceit boosting you can’t play on faceit until the order is done. We usually work from 12:00 to 20:00 CEST after that time you can use steam to play with friends in other leagues. 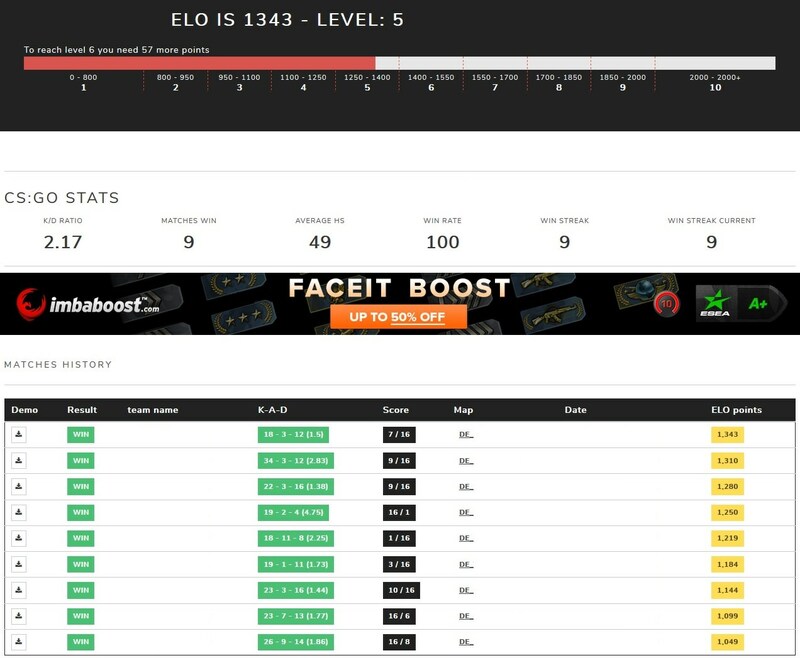 Faceit ELO Boosting – How it works? Faceit Test Game – How it works? Test Game is an option where new customers can check our Faceit boosting service. We offer 1 test game for a small price just to cover part of expenses so you as our customer can check us out, see how we play and then decide if you can trust us. That’s the best option for all new clients you don’t have to believe us on our word just check us! Play with us! Test Games on faceit are done in DuoQ mode where you play with us in one lobby. We will not ask you for your login details, so there is 0% risk 😉 TEST GAME is available between 12:00 and 20:00 GMT+1 only when we are making actual orders so you will have to wait for next faceit lobby session similar to your rank that can take from 1 hour up to 3 days. If you want it asap talk to our website support and ask when we can done next test game on faceit on your level. Faceit Placement Matches – How it works?